Here is a great snap shop via the Pioneer Press of how real estate sales differ across the Twin Cities and greater metro region. When real estate agents say real estate is local, it truly is. 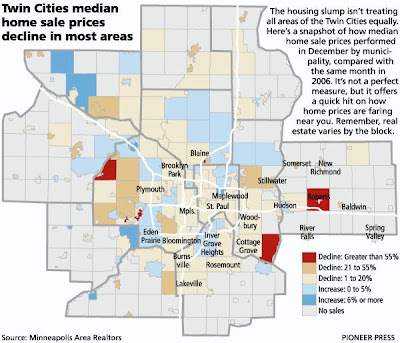 As you can see via the map, areas like Inver Grove Heights and Eden Prairie have seen average sales prices actually increase this last year, but other places like Credit River Township and Stillwater have seen the opposite. When you look at statistics by neighborhoods, you can further see variations in sales prices. There are some neighborhoods in Minneapolis that perform better than others. If you have any questions about your particular neighborhood, feel free to let me know. I will be posting this week market stats for the Minneapolis area so be sure to check back in a few days to see what has been happening by neighborhoods.